Far from Fair is a young readers book - the target audience 10-12 year olds (5th-7th graders). Elana Arnold has captured the essence of the saying "growing up is hard to do." The story is told through warm, delicate third person narrative and gives the reader a masterfully drawn picture of the emotional overload this young girl is trying to handle. The short, independently titled chapters are perfect for younger readers. I really enjoyed the unique titles that set the tone for each chapter. The font is easy to read and the oversized, bold print first letter is a classy touch. Far from Fair is a good book that has a lot going on. Sometimes I couldn't help but think - Oh my something else... There's so many things going on in this child's life - and sadly, it's that way for children everywhere, from all walks of life. The difficulties begin when Odette is told the family (including her brother Rex and his ferret and the new dog, Georgie) will be packing what's left over from the moving sale, into the RV, which they call "The Coach" and moving from California to Washington to help care for Grandma Sissy. Odette is devastated she has to leave her best friend Meiko and even more upset that her cell phone has been disconnected. The family of four will share a single cell phone. Odette is shocked, scared, angry, lonely, frustrated, and emotionally overloaded. It is within this tornado of emotions Grandma Sissy's favorite sayings begin to ring true. You see her mind processing this information and bringing it to life within her own family - slowly, using examples of things she's already seen, done and felt. The journey of her understanding and accepting all the things she felt were so unfair is powerful. When you see her change the number one thing on her list to "Cancer," you know it's not just the list that has changed....Odette has changed. It's a lovely journey that I enjoyed taking. It's one of those stories that you think about long after the book has been returned to the shelf. It leaves an impression on your heart. 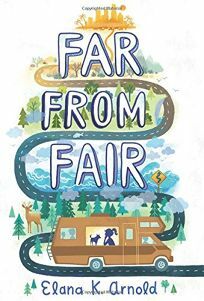 If you get a change to read Far from Fair, do so - you'll enjoy the journey.